Control everyday clutter and keep desks, countertops, and shelves clear and organized with Countertop Drawers! 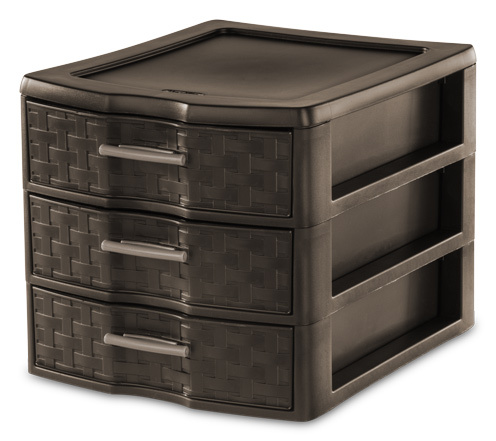 The Medium Weave 3 Drawer Unit is the ideal decorative solution for visible storage needs, for use in any room, for crafts, office supplies, jewelry, first aid supplies, beauty items, and more. The three opaque drawers conceal contents, while providing access to those items most frequently used. Easy pull handles allow drawers to open and close effortlessly, with a drawer stop to prevent drawers from being removed accidently. The stylish weave pattern adds a fashion touch in easy to clean durable plastic. The overall assembled dimensions for this item are 13 5/8" x 11" x 10". 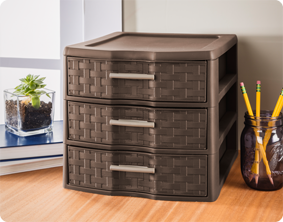 Overall Assembled Size: 13 5/8" x 11" x 10"
The Medium Weave 3 Drawer Unit is the perfect solution for freeing your desk from unwanted clutter such as mail, paper clips and extra 8½" x 11" paper. Medium Weave 3 Drawer Unit is rated 4.7 out of 5 by 7. Rated 5 out of 5 by Karen8962 from Great for the Classroom! I received the weave drawer set and took it into my classroom. As a teacher, I am always supplying my students with pencils, pens, erasers, etc. These drawers replaced the Sterilite shoeboxes I used to store these types of supplies in. These drawers are nicer looking, and they are easier for the students to maneuver. (4th/5th grade). I would say they are perfect, but I do have one suggestion for improvement. I would love to have received dividers that were flexible in placement. I didn't really need a whole drawer for pencils! To make up for this, I was able to find some trays which were just about half the drawer size. This enabled me the opportunity to best use the space. (see pictures) I also appreciate that they a deep enough in length to hold rulers. 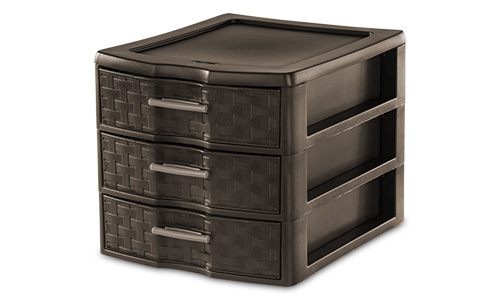 Overall, I am extremely satisfied with all other aspects of the weave drawers. "I received this product as part of a My-Take research study." Rated 5 out of 5 by Terrijo from So very useful! This is a fantastic product all the way around! I use this to store all of my cosmetics in and it’s the perfect size for the job! No more clutter in my bathroom, and the best part is, it matches my decor! Oh, and it’s extremely durable and useful. I’m planning to purchase a few more of these for different rooms in my home. I received this product as part of a My-Take research study. Rated 4 out of 5 by bluebird75 from Love the design and color except... ...that the drawers do not come out completely. I really like when they are removable as I like to wash containers after purchasing and also to take them out to fill them. I do get that perhaps the design was intended so that if anyone dropped the container or pulled a drawer too full, nothing would fall out. The color is lovely and fits in with our house decor, especially since we have kind of a country look where we live. Ours is being used for yarn and knitting storage...yarn, stray pieces of string, smaller needles, etc. It works great for organizing the items and keeping them dust-free! I appreciate the sturdiness of the container. The drawers are tough, and the sides of the storage unit are strong. Thanks, Sterilite, for another great product!! "I received this product as part of a My-Take research study." Rated 5 out of 5 by DCorrelle from Good Quality I love this. I have the smaller version as well and they are both great. This one I have been using to store loose papers (recipes I haven't sorted yet, coupons, etc). I keep it in my kitchen dining area on a bookshelf and it blends right in with my decor because of the brown basket design. I would recommend this! I received this product as part of a My-Take research study. Rated 5 out of 5 by KatieAnn from Exactly What I Needed! I had been overrun with papers on my desk and this 3-Drawer Weave Unit was perfect. I separated my papers into different categories, put them into the drawers, and the drawers ended up holding a lot more than I was anticipating. I will most likely be buying one just like it for some other organizing I need to do for work. I received this product as part of a My-Take research study. Rated 5 out of 5 by snowflake from Useful and Cute! Such a great drawer unit!! I was impressed with the style, shape and color. The weave texture really makes this unit classy and unique. The drawers are roomy and perfect for keeping those little things together. It is perfect for so many things, that you will want more than one. I like how easy the drawers slide out and in and are sturdy and are able to hold heavy or light items. It is truly a wonderful unit! I received this product as part of a My-Take research study.